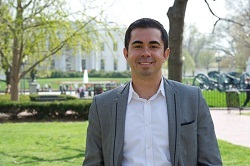 Patrick became interested in the Foreign Service and the Rangel Fellowship at the same time. In the summer of 2009, he received a Critical Language Scholarship from the State Department for the study of Korean language. During orientation in Washington, DC, several Foreign Service Officers spoke about opportunities in the Foreign Service and also spoke about the various State Fellowship programs. From that moment, Patrick decided he wouldn’t go to law school but would instead begin preparing for graduate school and the Rangel Program. After his experience in Korea, Patrick applied for and received the 2010 Rangel Graduate Fellowship. He is now serving as a Watch Officer in the State Department Operations Center. He previously served as the Assistant Information Officer and Special Assistant to the Ambassador in Bogota, Colombia. He also has served as a Consular Officer in Embassy Islamabad and the Staff Assistant to the Special Representative for Afghanistan and Pakistan. For Patrick, the Rangel Program was the perfect fit because of his upbringing and his culture. “The Native Hawaiian culture is about stewardship and family. The Rangel Program parallels that in many ways. The program provides opportunities for excellent mentorship, professional development and this is done all in a family setting. The Rangel Program is all about family, whether it be with our director, mentors or other fellows.” During the summer of 2011, as a Rangel Fellow, Patrick attended the Johns Hopkins University School of Advanced International Studies. He spent his overseas internship in Seoul, South Korea working in the Public Affairs section of the U.S. Embassy. While there, he assisted in the development of programs for community outreach to college students. He also got the opportunity to travel to various places in Korea giving speeches to school-age Koreans about volunteerism and American Politics.